The Spähpanzer 2 Luchs (Lynx), with a total build of 408, was introduced into the Federal German Army in 1975 where it was used in the tank reconnaissance units. 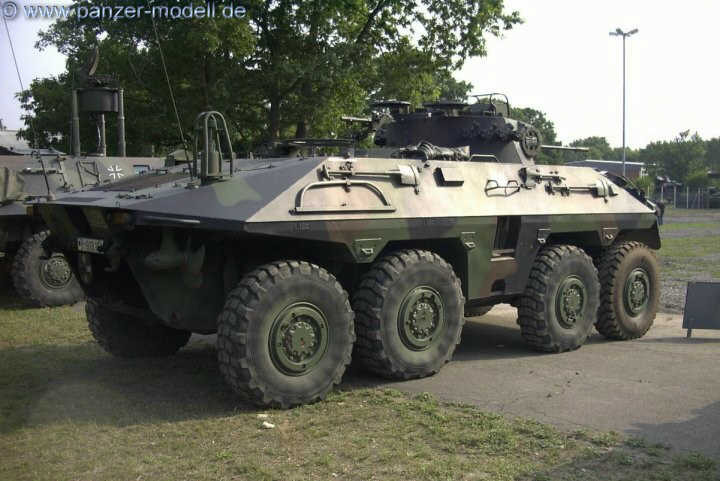 This all-wheel drive Luchs made by Thysson-Henschel is well armoured, has NBC protection and is distinguished by its extremely low running noise. The eight large low pressure tyres have emergency running properties; for speeds up to about 50 km/h all eight tyres can be steered. A special feature of the vehicle is that it has a second station for a second rear facing driver. Vehicles that were modified to give them an improved ammunition feed later received the extra designation Luchs A1. This model first hit the shelves in the late 1990’s and so this latest release of the Spähpanzer 2 Luchs from Revell of Germany may be older than some of the people building it. As this is a re-release and I am providing a link to a review of a previous release of this kit by Sean Langley, I will keep this review short. Taking a look at the moulding quality, I was pleased to find the sprues free of flash and problems of that nature; not bad for a 20 year old product. Things are not so good when it comes to sink marks, a problem that Revell of Germany seems to suffer on a number of products, this one is unfortunately the worst I have come across. There are 18 sink marks on the upper and lower hull parts in total, the 8 on the lower hull are in the wheel wells and should be easy to fill and sand, that is not always true for the 10 in the upper hull and some of these appear where there is detail. While the filling and sanding here will result I believe in the need for some re-scribing of detail, it is thankfully the only really troublesome area I located. The suspension and drive is where this model is very nicely detailed and despite no really being seen is a good area of the model. The tyres are solid vinyl and I do mean solid as there is no hollow recess in them. Thread detail is good and another plus is that there are no seam lines to clean up. One aspect I really like about this model is the travelling beacon which is supplied as a clear part with a hollow inside, this should look quite good and will be far better than the solid parts usually supplied with kits in the main sprue plastic colour that require painting on the outside rather than the inside. The turret is quite small and almost looks as if it was an after thought of the vehicle manufacturer that said it appears to have been well replicated in this kit. It is the turret where you decide if you wish your model to represent the early or late version of the Spähpanzer 2 Luchs. These 2 options basically boil down to a change of barrel and the infra white/red light fitting. The tools supplied with the model are separate, but have moulded on clamp detail. The moulding of the hull is very disappointing and will require a lot of work to correct and scribe, otherwise it looks a very pleasing model for the money and will be a good sized addition to your collection. I will admit to having looked forward to the next release of this model as I have seen some very nice finished examples of it. Highs: The suspension and drive of this vehicle have been well replicated in the model. Lows: The sink marks in the hull, both upper and lower have the potential to test your patience. Verdict: At the right price this model is worth picking up, but be ready to possibly being in need of the filler. There are two glaring inaccuracy with the reveal kit. 1. The hull sides below the top of the wheel well slopes inwards at a significant angle towards the bottom, not vertical as depicted in the kit. 2. The gun Mantlet does not leave a gap underneath when the gun elevates. Check here: http://www.panzer-modell.de/referenz/in_detail/Luchs/Bild_005.jpg The whole thing requires some major surgery. Here a report from a modeller who did the surgery. http://f3.webmart.de/f.cfm?id=2078181&r=threadview&t=4002602&pg=1 Not a piece of cake. H.-H.